Preferințele Appearance vă permite să modificați unele aspecte vizuale ale Haiku. Haiku definește trei fonturi standard pentru scopuri diferite. Stabiliți tipuri și dimensiuni de font plan, aldin și fixat care vor fi utilizate în întreg sistemul. Pe lângă acestea, există de asemenea o configurare separată pentru fontul utilizat în meniuri. 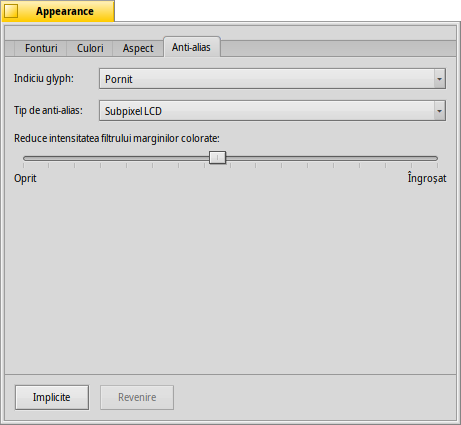 /boot/system/non-packaged/data/fonts/ttfonts/ pentru fonturi disponibile fiecărui utilizator. 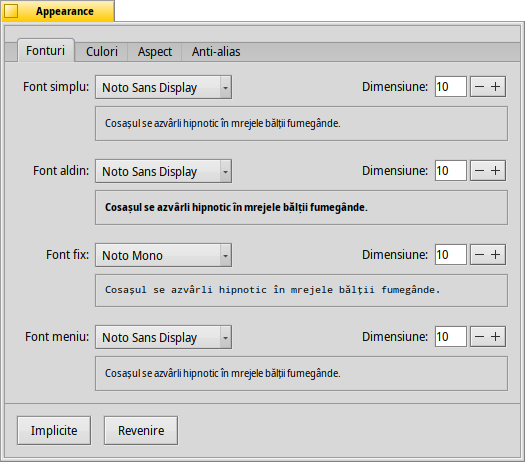 /boot/home/config/non-packaged/data/fonts/ttfonts/ pentru fonturi disponibile doar pentru tine. 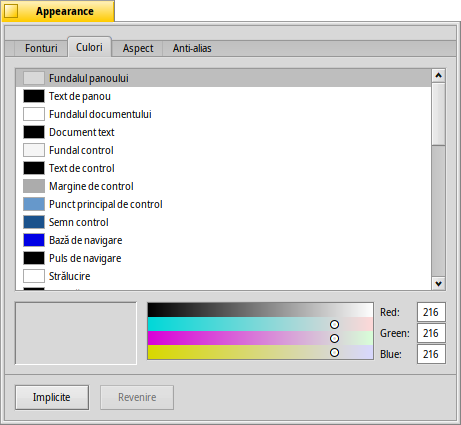 In the Colors tab, you can change the colors of different parts of the user interface. The color well accepts drag & drops from other programs, letting you drag colors over from e.g. WonderBrush, Icon-O-Matic or the Backgrounds panel. Tabul Antialias oferă diferite configurări pentru modul în care sunt randate obiectele pe ecran. An activated Glyph hinting aligns all letters in such a way that their vertical and horizontal edges rest exactly between two pixels. The result is a perfect contrast, especially when dealing with black on white. Text appears crisper. 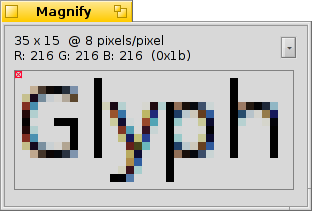 There's also a setting for Monospaced fonts only that's especially helpful with low resolution devices like netbooks. Small fonts can look pretty bad when hinting is turned on, but with this setting you still have the advantage of hinting for text editors and Terminal. It should be pointed out that all the Magnify windows on this page are of course rendered themselves with the different options as well. 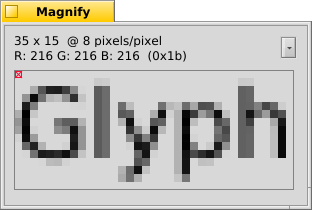 So, you get a real world impression of the settings by comparing, for example, the bold yellow tab title or the text "33 x 15 @ 8 pixels/pixel". Grayscale changes the intensity of pixels at the edge. 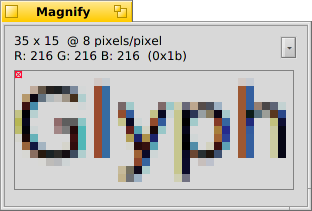 LCD subpixel does an even better job, especially with (high resolution) LCD monitors. Instead of the intensity of a pixel, it changes its color which moves an edge by a fraction of a pixel, because LCD displays produce every pixel with a red, green and blue component. Subpixel based antialiasing adds a slight colored shine to objects. Something not everyone tolerates. 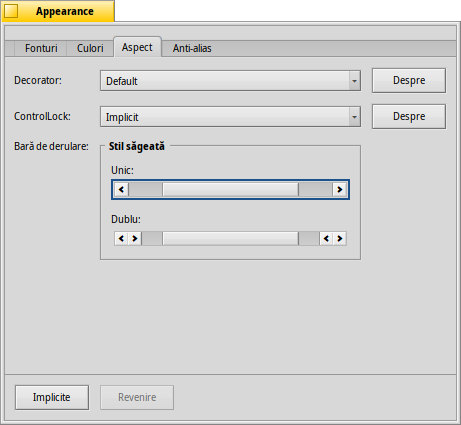 In Haiku you can mix the two antialiasing methods and find the right setting for you by using a slider. 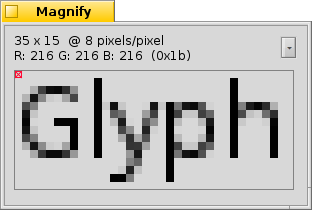 The subpixel based antialiasing in combination with the glyph hinting is subject of a software patent and is therefore not available by default. Depending on where in the world you live, you may get an unlocked version. Sorry about that. Talk with your representative. Implicit resetează totul la valorile implicite. Revenire aduce înapoi configurările care au fost active atunci cînd ați pornit preferințele Appearance.